When Supernatural premiered back in 2005, no one could have predicted that the show would make it to Season 14 (or now Season 15, since the show’s been renewed!). Certainly, Jensen Ackles didn’t expect his journey to end up on a red carpet event in Vancouver celebrating Supernatural‘s 300th Episode. We spoke with Ackles about what it means for the series to make it to 300 episodes, “I remember way back in Episode 3 thinking, ‘Wow, we might get like a whole couple seasons out of this. This show is really good.’ I was super fired up about it,” Ackles said. Check out Ackles reflect on Supernatural and what it means to make it to 300 episodes in the below video. Supernatural has gone much longer than he expected 10 years ago and Ackles hasn’t lost any enthusiasm for the Winchesters, the characters or the story. Here’s to 300 more! 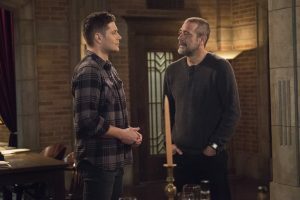 Supernatural‘s 300th episode, “Lebanon,” airs Thursday, February 7 at 8/7c on the CW.